The time is now – let us push the preservation of the Hambacher Forest and the coal exit! We call all of you to join us on 6 October for an action around the Hambacher Forst – in addition to our long-planned mass action of civil disobedience from 25 to 29 October 2018. Originally published by Ende Gelaende. What happened in the Hambacher Forst (Hambi) in the last two weeks is shocking and almost unbearable. Despite the terrible accident, which happened in the forest, the madness continues. Besides grief, we also feel anger: during the last two weeks we had to watch how the police – following the orders of the state government, hand in hand with RWE – cleared, destroyed tree houses, felled trees and risked the safety of activists. RWE is doing everything it can to clear the last remnant of the Hambach Forest for brown coal. This is a scandal! We will not let that happen! United we stand: we will not accept the destruction of the forest and the eviction of the occupation. The resistance is growing: thousands are coming to the Rhineland these days. We are powerful, diverse and determined to fight for the preservation of the Hambach Forest. Now more than ever! Where injustice becomes right, resistance becomes an obligation. That is why we, as the Ende Gelände alliance, call you all on Saturday, 6 October 2018 to join us in the Hambach Forest. Together we will join the big demonstration “Save the forest! Stop coal!”. Starting point is at 12 o’clock at the train station of Buir. Let us raise our voices to make clear: Hambi stays! Climate justice – locally and worldwide! Our symbol against destruction will be hammocks. Due to the fact that: forests are among the most popular places for recreation. And: RWE is not allowed to disturb the residents* inside the Hambi any further. Together we will sit down and draw a red line. We call on everybody to bring (red) hammocks and red fabric with you. The woods to those who cling to them! We will inform you about overnight accommodations on the weekend (as usual – on short notice). We are very delighted to be able to offer you a get-together twice this autumn – spontaneously on 6 October and of course from 25 to 29 October at the long planned mass action of civil disobedience. Ende Gelände, Hambi stays! – One Struggle, One Fight! On the same weekend the autonomous centre (AZ) in Cologne hosts the RabAZ. The AZ is one of our allied places, which is also threatened by eviction. Therefore we would like to invite you to the action and networking days https://az-koeln.org/rabaz/, in particular the soli-demonstration on 7 October (Sunday). Next post: #Athens: From #Skouries to #HambacherForest: One struggle – One fight! Demonstration October 6: Save #HambacherForest – #EndCoal! – Enough is Enough! Reportback: Thousands building barricades on a sunny afternoon in #HambacherForest – Enough is Enough! #HambacherForest: ​​#Paragraph11 evicted on Monday – Cops vandalized #Wiesencamp – Enough is Enough! 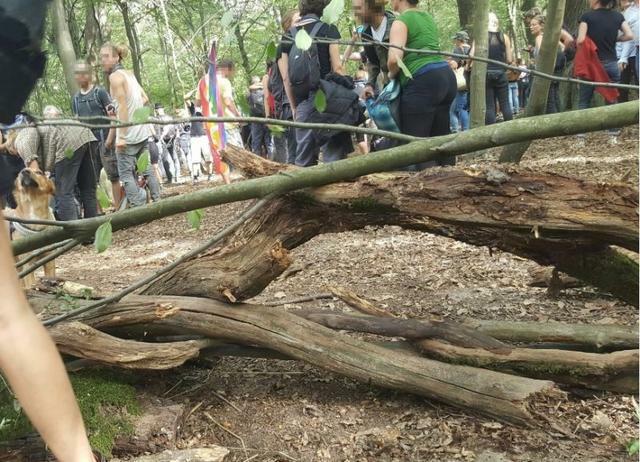 #HambacherForest: #RWE escalates conflict with forest defenders after 20 days of evictions – Enough is Enough! All infos for #EndeGelaende action at October 6 in #HambacherForest – Enough is Enough! ALL OUT to #HambacherForest after cops banned tomorrows demo – Enough is Enough!